The edition of 108 selected icons kept at the Institute of Oriental Manuscripts of the Russian Academy of Sciences introduces one of the greatest Russian collections of Buddhist icons painted in Tibetan-Mongolian style. 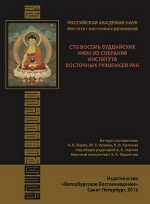 The edition consists of the following main parts: 1) the introductory paper characterizing the collection of icons kept at the IOM RAS and methods of its representing, some features of Buddhist iconography are also described; 2) color reproductions of 108 icons of special artistic and religious interest supplied with descriptions in Russian and brief annotations in English; 3) the index of figures depicted. The edition is based on the e-catalogue of more than 1300 painted thang ka and tsa ka li icons kept at the IOM RAS that was compiled in 2008/09. At the Department of Central and South Asian Studies, the PhD dissertation by E.S. Bushuev Sanskrit Written Sources on the History of Tantric Buddhism of the 7-11th centuries will be discussed.